On Wednesday, Cosatu attempted to follow up with its promise to deliver “the mother of all strikes” against State Capture, corruption generally, unemployment, job losses in the mining sector, and just in case he was feeling left out, Herman Mashaba. Unfortunately, despite the strong backing of the SACP, Cosatu was not able to break any new records for attendance, or bring the country to a halt. Or even large parts of it. This strike would appear to be proof that Cosatu is not what it once was. The once proud labour movement that could claim to have the support of millions of workers is simply no more. But the roots of this don’t have much to do with the confederation’s recent choices, or even the departure of Numsa and Zwelinzima Vavi. Rather, it has to do with the choice it made to go into the Alliance in the first place. By STEPHEN GROOTES. 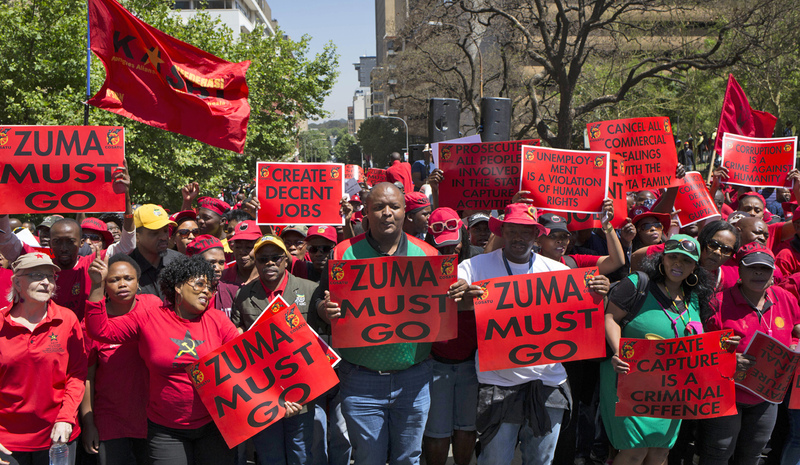 Cosatu claimed to be marching against many evils on Wednesday. For most journalists, the headline would have been the protest against State Capture, which proves the middle-class view that the Guptas and President Jacob Zuma are inherently evil and corrupt. But other aims were stated for the march as well. It was also aimed as a general protest against big business, the banking sector and the Chamber of Mines. In a typically South African way, big business in the form of Business Leadership SA and the Chamber of Mines supported the march, while Mashaba’s view was not recorded. But with so many aims for one event, this could have been better described as a “Protest against State, Capitalism, its Major Players, and whoever else we feel like today”. This is also vintage Cosatu. Many of its big strikes and protests have had multiple aims. It does this because that makes it easier to form a coalition of forces. In a movement representing many unions, with different constituencies and immediate goals, it is easier to get people to join a march if they can all be protesting for different reasons. But such a broad spectrum of opponents often has a diluting impact. Zuma himself could dismiss this protest as being against big business, while big business could say it was all about the Guptas. For Cosatu’s partner on Wednesday, the SACP, it was all about State Capture, and that point appears to have come through clearly from its members. It is always nearly impossible to come up with hard and fast numbers for protest action such as this. Many people say they’ll come and don’t, others join the protests spontaneously because they have nothing better to do. Organisers often blow up the numbers, critics do the opposite, and the police often don’t have the time to come up with even a good estimate. It is undeniable, however, that Wednesday’s protests simply did not have the force, or devastating effect, of the kind of march Cosatu could have organised a decade ago. There are many reasons for this “march anaemia”. It is obvious that the federation is missing the numbers and financial muscle that Numsa was able to provide. Numsa’s ejection may also have removed many members who could be described as having “radical” beliefs, and perhaps provided an ideological underpinning of the protest action. Over time, the power of unions in the private sector has waned, as it has in many other parts of the world. This has left Cosatu a federation comprised more of workers in the public sector. And this then leads to the federation’s next problem: because it has insisted on remaining in what it now calls a “dysfunctional” alliance with the ANC, it is literally in bed with its members’ bosses. Ten years ago, in 2007, Cosatu led a massive public servants’ strike. It was huge, nothing like it has been seen since. Estimates at the time suggested that, in Pretoria alone, 50,000 people took part in the protest that accompanied it. It was an industrial action that led to hospitals not having nurses and other staff, while teachers left children unattended in class (in some areas, white teachers who had previously objected to having to being forced to pay subscription fees to Sadtu learnt to toyi-toyi so they could join the protest). At the climax of the march in the middle of the strike, an incident occurred that perfectly explains Cosatu’s main problem. Thousands of people were massed in Church Square in Pretoria. Zwelinzima Vavi, the man who some people still think is the federation’s general secretary, had explained in graphic detail why they were so angry with government. Then, the representative of that government, in the form of then Public Service and Administration Minister Geraldine Fraser-Moleketi, emerged. She was escorted to the speakers’ platform by a small squad of the police’s Special Task Force (which is a group of people that no one, and really no one, ever should mess with). Once on the platform, she was engulfed in a huge hug by Vavi, many feet taller than her. It was a signal by Vavi that she was part of the same movement as the Cosatu members, who were so angry, just metres away. It is possible that the hug, which drew the sting of some of that anger, was even choreographed in advance and a condition of Fraser-Moleketi coming out in the first place. In the end, Cosatu and government hammered out a deal, and the strike ended. Or, if you prefer, two members of the same alliance worked out something they could all live with. The point of this is that in the end, the problem is that Cosatu and the ANC must have different interests and different aims. The aim of the ANC is to exercise political power through its control of government. The aim of Cosatu is to improve the lives and salaries and conditions of its members. The two simply cannot be reconciled. If there is one thing that almost always defines unions and their leaders, it is that for their members they always want one thing – more. There is nothing wrong in that, that is the point of their existence. But if you are in government, you have to provide services for people, and keep the country running. Governing requires trade-offs, you cannot simply give workers “more”. You have to ensure that you don’t blow the budget on salaries (which is what successive finance ministers have warned of over the last five years), and have enough money to invest for the future. The reality of the conflicting interests is something that becomes obvious to union members who then go into government. Those who have become ministers don’t appear to spend their time trying to improve the lot of workers; rather, they realise that they have to govern. They become part of government and, in the end, part of the ANC. Nothing typifies this more than someone like Ebrahim Patel. The union movement from which he comes wants Zuma out of power. Now. But he has not spoken against Zuma or State Capture in any meaningful way. He has not said that he voted against him during Parliament’s confidence motion. He did not vote against him publicly during any of the non-secret ballots on the question either. This is part of the relationship between the ANC and Cosatu in which Cosatu sometimes seems to play the battered victim and start behaving like the more powerful side’s soldier: when you get hurt enough by someone, you then hurt yourself as well. Cosatu’s recent history shows that the ejection of Numsa and Vavi was their criticism of the ANC in general and Zuma in particular. Numsa took a formal decision to leave the alliance, and was forced out of Cosatu as a result. Cosatu President S’dumo Dlamini’s people, perhaps unwittingly, were guided missiles who accomplished Zuma’s plans but lit the fire under the remaining ruins of a once powerful organisation. In the longer run, Numsa and Vavi have been shown to be right, and the rest of Cosatu wrong, horribly so. Critics of Dlamini would argue here that he has much responsibility to bear. He seems to have played a role in forcing out Vavi and surely Numsa as well, and is a supporter of Zuma, who obviously has played a big role. It would certainly not be in the interests of someone who has wondered aloud about the benefits of “being a dictator for six months”, as Zuma have, to face a strong and vibrant union movement. The Government, the Alliance, Cosatu itself, Parliament, the ANC as a whole, the economy, all lie broken in the wake of his disastrous tenure. However, the role Zuma has played should also not be overestimated and he should not be seen as a sole cause of Cosatu’s decline. Unions around the world are battling, and union movements are becoming dominated by public sector unions. A union federation that called on members to protest against government policy on the one hand (on issues such as labour broking), and then called on members to organise in support of that same government on the other, was always going to look schizophrenic. Workers would be right to ask whose interests the movement was actually serving, because of this relationship with the ANC. It seems now that Cosatu’s weakening is almost certainly set to continue. It may in the end opt for survival, and even a rebuilding, and make a clean break from the alliance. It could be galvanised, strangely, by an Nkosazana Dlamini-Zuma victory in December and a split in the ANC. It would presumably support a new movement led by the people who lost that conference. But in the end it would come back to the same problem.